FX's American Horror Story wrapped up its seventh season in mid-November, and fans have been impatiently awaiting any details about Season 8. 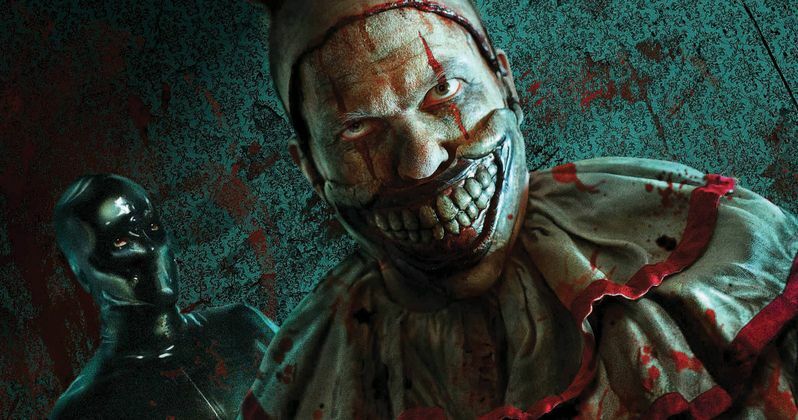 FX renewed American Horror Story for Season 8 and Season 9 back in January, and during the TCA Winter Tour today, series creator Ryan Murphy was bombarded with questions about the new season's setting, where he delivered quite the bombshell. The series creator revealed that the show will be going one place the show has never gone before: the future. "All I'll say is that I want to go to the future, still topical, but the future, which I've never done." When pressed for more details during the TCA Winter Tour panel, creator Ryan Murphy confirmed that the show is not set in outer space. While no cast members have been confirmed yet, Ryan Murphy added that he hopes Evan Peters would return, since he has starred in every season including American Horror Story Season 7, but he wasn't sure yet if he would return. His Season 8 return may be made more difficult since he has been cast on Ryan Murphy's new FX series Pose, which is set in the 1980s and will feature the largest transgender cast in TV history. While Ryan Murphy wouldn't offer any more specifics about the new season, he did mention how he pitched his Season 8 idea to FX CEO John Landgraf, who "loved" the idea." "I pitched it to John Landgraf today right after his TCA panel, and he loved it, but he's asked me not to say what it is. I told him and he fell out of his chair with joy. I think people will like it, it's different from what we've done before, but I always try and do the opposite of what I've done on that show." Ryan Murphy was also asked about the highly-anticipated American Horror Story crossover season, confirming that it's still happening, but it won't likely happen until Season 9. The series creator teased that they are already working on the show, even though it won't happen until 2019. Here's what he had to say about the crossover below. "We're working on it, but that's not going to be (Season 8). That will probably be the one after that. We've already met about it and outlined it. But it won't be next because some of the (cast members) are not available." The show hit a bit too close to home this season after a mass shooting scene had to be cut from an episode of American Horror Story: Cult, after the Las Vegas mass shooting. Ryan Murphy also confirmed that the next season of American Crime Story will center on the Hurricane Katrina aftermath, and that the new season of Feud, entitled Feud: Buckingham Palace, centering on Prince Charles and Princess Diana, will start shooting in October. You can head over to Deadline for more from the TCA tour today.